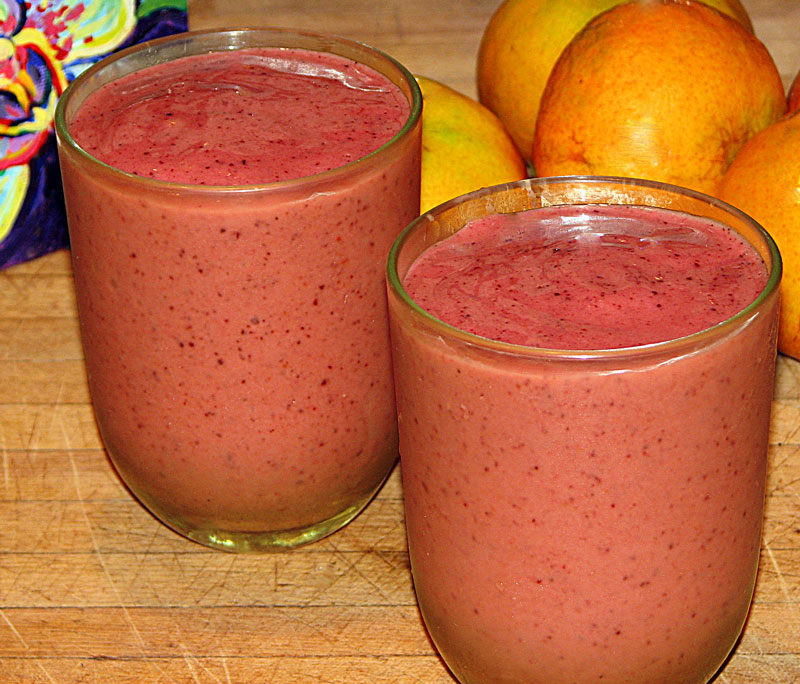 Well, we’re back in Hawaii, so it’s Fresh Fruit Smoothie time…they’re simple to make, they taste great and have the consistency of creamy soft serve ice cream. For this one, I took fresh picked papayas and bananas, cut them into 1/2 inch chunks and froze them overnight. 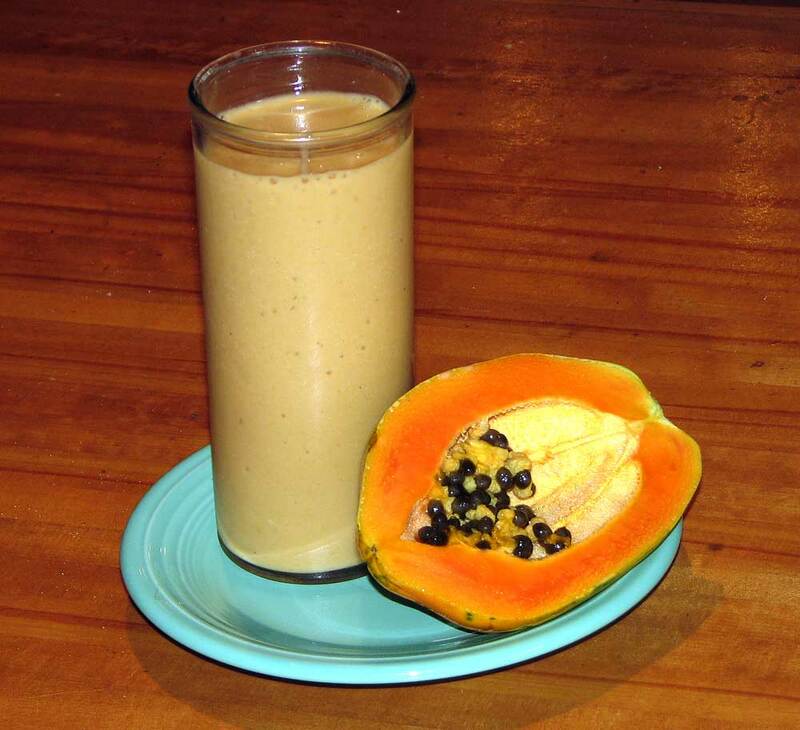 To make the smoothie, put about a cup of frozen papaya chunks, a cup of frozen banana chunks, 6 oz. of your favorite blueberry yogurt (I use Dannon) into a blender and add about 3/4 cup of fresh squeezed orange juice (if you don’t have orange juice, V8 Splash is a great alternative…it’s available everywhere. I use their Tropical Blend, but any flavor will do). Pulse the blender for about 30 seconds, give it a quick stir (make sure the blades have stopped! ), and repeat a few times. It should be very thick at this point, so to get the perfect consistency, take the top off the blender while it’s running (make sure all the fruit has been pureed before you do this or you may end up wearing some smoothie) and slowly pour in a little more juice until you see a vortex form in the center-you’ll know what I mean when you see it happen-and the Smoothie will be perfect. 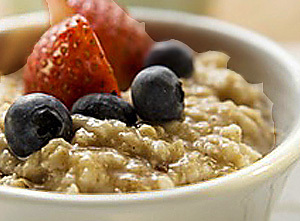 If you love peanut butter like I do, you can add a heaping tablespoon (I prefer chunky) and blend for a couple of seconds more…it’s incredible! 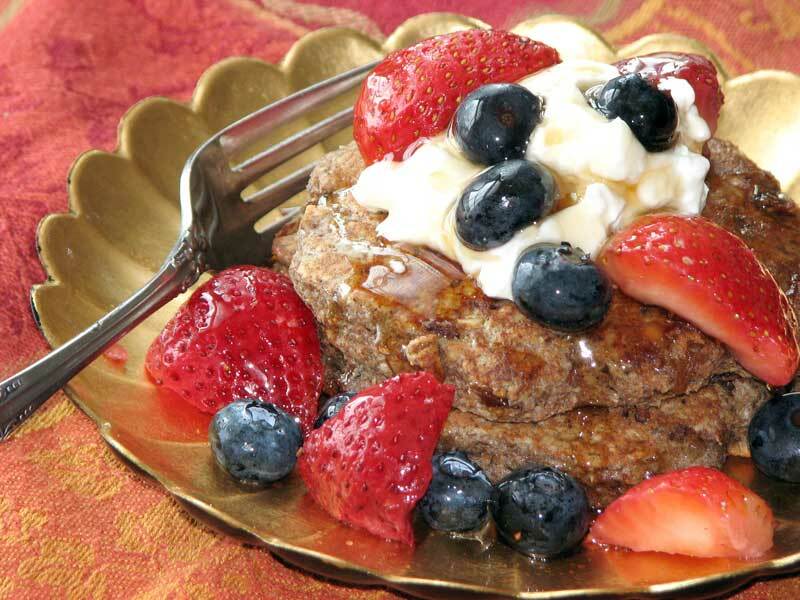 OK…I personally could care less whether this is high-carb, low-carb or no-carb…all I know is that it tastes (and looks) great, is really simple to prepare and you can just pop a slice in the microwave for a quick breakfast. If you happen to live with someone who cares about carbs (like I do), the best thing about this dish is that you can really enjoy it together (you don’t have to fake it)…it’s that good! If you want an even healthier version, just substitute Eggbeaters for the eggs. 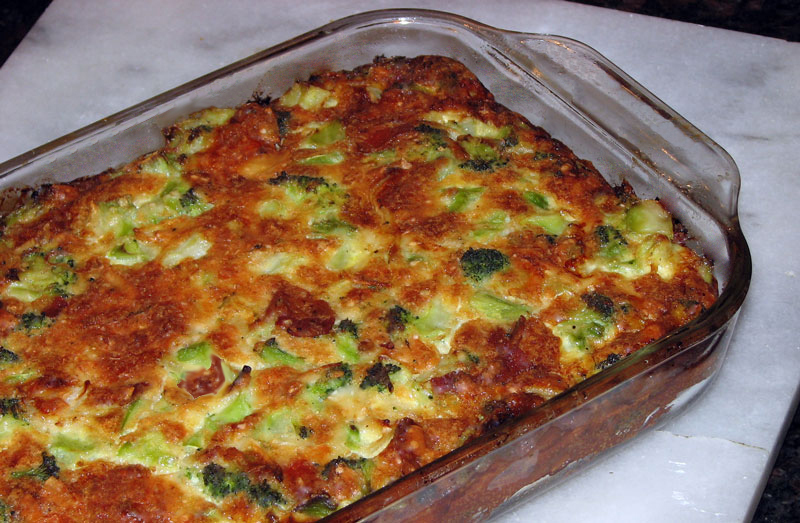 And for a great variation, replace the onions with a cup or two of caramelized onions…it really adds a ton of flavor to the quiche. 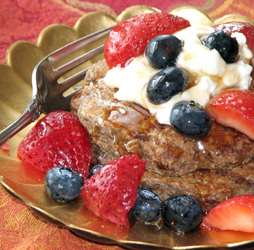 Please click here for a printable copy of the recipe. These are a great addition to any breakfast, but with a couple of eggs and some bacon and toast, you feel like you’re having breakfast in a great New Jersey diner (and make no mistake about it…there are no better diners than Jersey diners). Extremely simple (and fast) to make…just 1/4 inch dice a russet potato and some onions. Then put the diced potatoes in the microwave, covered, for a minute or two (depending on the quantity) until partially cooked. 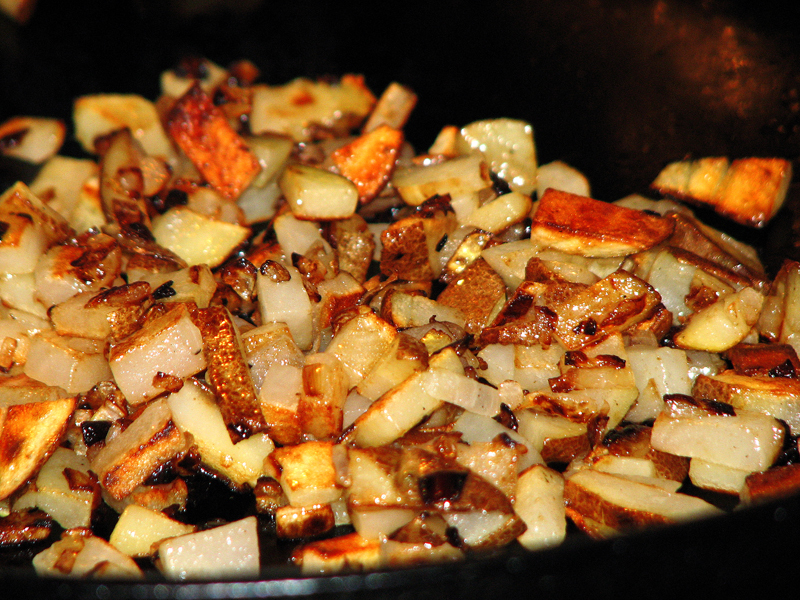 Heat up a skillet (preferably a cast iron one), add a couple of tablespoons of vegetable oil and/or butter (and if you are cooking bacon, use about 1-2 tablespoons of the bacon grease instead of the oil to add tons off extra flavor), toss in the potatoes and onions, season with salt and pepper and let them fry, stirring occasionally, for about 4-8 minutes until golden brown. I use a cast iron bacon press to press them down between stirs so they crisp up faster and more evenly, but it’s not necessary. That’s all there is to it…try and you’ll agree it doesn’t get any better then this! I think this may be my favorite breakfast sandwich. It puts all those fast food breakfast sandwiches to shame and it couldn’t be easier. 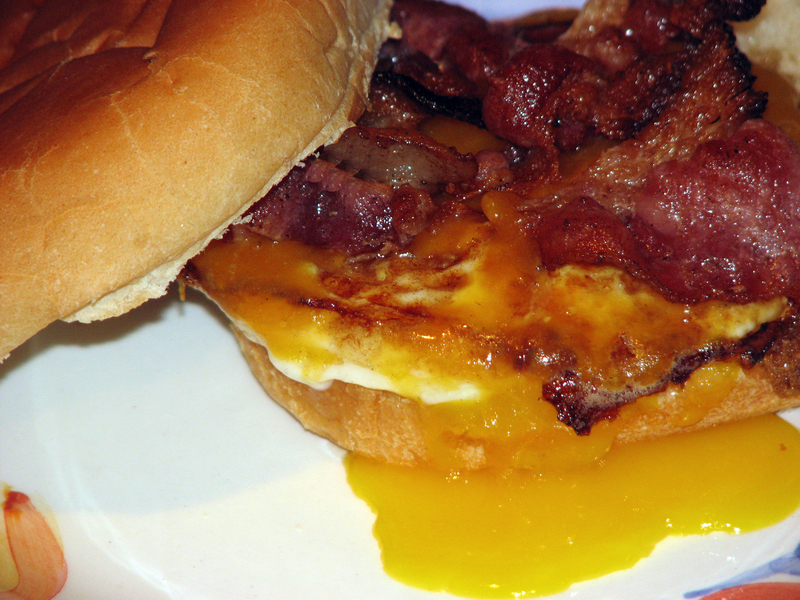 It consists of one egg over easy, topped with melted extra sharp cheddar cheese and crispy bacon on a soft roll. One of the secrets to making the sandwich is how to get the cheese melted perfectly without overcooking the egg. The best way to quickly melt the cheese is, as soon as the egg is flipped, lay the cheese on top of the egg and drop a teaspoon of water into the pan next to the egg and immediately cover the pan. The resulting steam will melt the cheese in seconds. This technique also works great for cheeseburgers. Another really cool tool to have in your kitchen is what’s called a bacon (or steak) press. One of its many uses is to keep bacon flat as it cooks…it’s especially good for the B in BLTs.